# ሰበር ዜና # አሁን ላይ ቡሬ በተኩስ እየተናጠች ነዉ፤ቁጥራቸዉን በዉል ባናዉቅም የሞቱ ሰዎችም አሉ።ጎበዝ የገረመኝ እና በህይወቴ ያዘንኩበት ያለቀስኩበት ቀን ቢኖርልጆቻቸዉ የሞቱባቸዉን እናቶች የሲቃ ለቅሶ የሰማሁባትን በዛሬዋን መሪር ቀን ነዉ።እናቶች በልጆቻቸዉ ሞት እኛንም ጨምሩን እያሉ መርት ወድቀዉ ሲያለቅሱ ሳያቸዉ ጎበዝ ብታምኑም ባታምኑም እንባ አዉጥቼ እልቅሻለሁ። ለቅሶዬ ሰዉ ሆኜ ስለተፈጠርኩ እንጂ ለቅሶ በራሱ በነፃነት የምንተነፍስበት አየር ይሰጠናል ብዬ አይደለም። ከህዝብ በተፈጠሩ በአርያ ስላሴ ሰዉ ሆነዉ ነገር ሰዉ በላ በሆኑ አጋዚዎች ለምን ይሄን ያክል ጭካኔ? ለምን ይሄን ያክል ጥፋት? ብዬ ጥያቄ ዉስጥ ገብቼ አመረርኩ። በአመርም ባለቅስም ለዛሬ መልስ የለዉም። ምን አልባት ጊዜና መስዋእት የሚፈታዉ ጉዳይ ይሆናል።በነገራችን ላይ ዛሬ በቡሬ ላይ ሞት ብቻ አይደለም የተስተናገደዉ ብዙዎችም ተደብድበዉ ቆስለዋል። ከተማዋ በሰዉ በላ አጋዚዎችና መከላከያ ወታደሮች ተጥለቅልቃለች። ሚካኤል አካባቢ ያለዉን ህዝብ ለመበተን እየጣሩ ነዉ ህዝቡ ግን አሁንም ተቃዉሞዉን አጠናክረን ቀጥለናል። ከወዲህ ከወዲያም የተኩስ ድምፅ እያስተጋባ ይገኛል። በእኛ ላይም አስለቃሽ ጋዝና የባሩድ ጭስ አልብሶናል። ጎበዝ እንያ በልጆቻቸዉ ሞት የሚያለቅሱ እናቶች ድምፅ ጆሮዬ ዉስጥ ገብቶ ግን ለምን እያልኩኝ አሁንም እያስለቀሰኝ ነዉ። ልጆቻቸዉም ለአንዴ ላይመለሱ አሽልበዋል።voice Of Amhara!!! 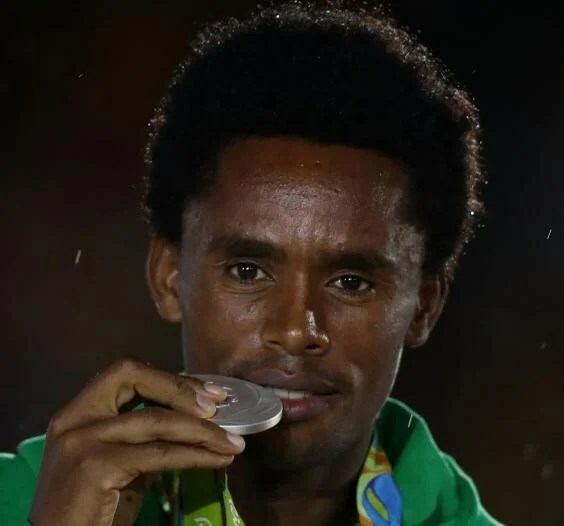 An Olympic marathon runner marked winning his silver medal by staging a dramatic protest against the Ethiopian government – risking his own life in the process. Feyisa Lilesa crossed his arms above his head as he crossed the finish line in second place following the gruelling 26.2 mile race yesterday. The gesture is a sign of solidarity with the Oromo people, who are protesting against being moved from their farmland by the country’s government. 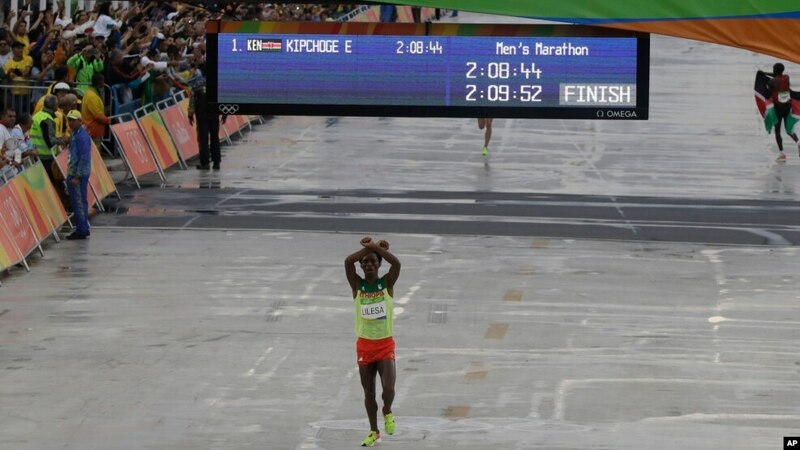 The runner, who was defeated by Kenya’s Eliud Kipchoge, claimed he may have to flee his home nation after making the sign. 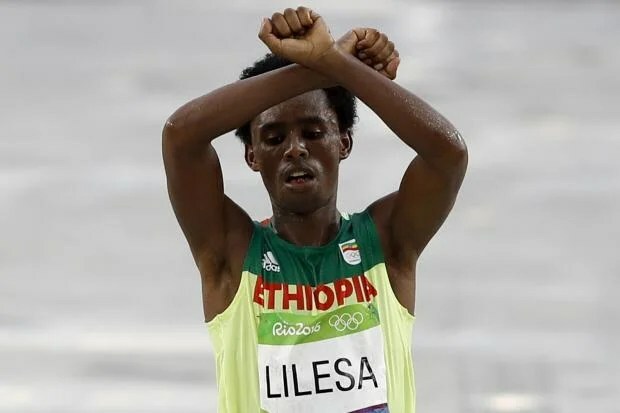 At a press conference following the race, Lilesa repeated the sign and said if the Ethiopian government “did not kill him” they would “put him in prison”. He said: “The Ethiopian government is killing my people so I stand with all protests anywhere as Oromo is my tribe. “My relatives are in prison and if they talk about democratic rights they are killed. I raised my hands to support with the Oromo protest. “If not kill me, they will put me in prison. Numerous protests have struck Ethiopia this year, including rows over government attempts to reallocate land in the Oromo and Amhara regions. Protesters in the Amhara region – from the Welkait community – took to the streets of the city of Gondar in July over the reallocation plans. The Oromos, who make up around a third of the population, believe that they have been excluded from the country’s political process and economic development. According to the BBC, New York-based Human Rights Watch says that more than 400 people were killed in clashes with the security forces in Oromia, although the government disputes this figure. Calls for international investigation emerge following deaths of more than 100 people in demonstrations last week. The violence has led to 400 deaths since November, 100 of them in the last week alone, according to human rights groups. The Ethiopian government is accused of using excessive force in the Oromia and Amhara regions, where protesters have been calling for political reforms. Human rights groups have called the response ruthless, while the UN wants to send international observers to investigate. Ethiopia has denied that request, saying it alone is responsible for the security of its citizens. Source: Al Jazeera :What is triggering Ethiopia’s unrest?